In 2010, Chris Butler contacted me to see if I would be interested in helping him to develop the visual style for his feature film ParaNorman. I jumped at the chance and myself and my good friend Tomm Moore spent many months sending conceptual artwork over to Laika as the Production designer Nelson Lowry came on board with Chris to steer us in different directions. 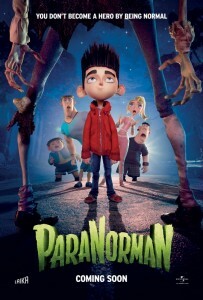 Great artists such as Pete Oswald and Trevor Dalmer joined in and finally we all settled on a style that worked with the amazingly unique character designs and the ParaNorman world was born. I then jetted off to Portland and worked in Laika for 8 months with the team designing locations, elements, scenarios, conceptual artwork and other doodles.. Here is a selection of some of the artwork from that time..